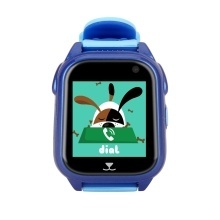 This is a multi-function smart watch for children, which features various functions, such as, GPS + LBS location, phone book, intercom, voice chat, remote voice monitoring, remote camera, SOS emergency alarm, electronic fence, low battery alarm, remote shutdown, etc. It adopts advanced GPS + LBS positioning to get real-time position and anti-lost of kids. By plugging in SIM card, you can talk with kids and kids can also dial the SOS number when in emergency. Good watch combines normal watch with GPS locator technology, and through the APP, the watch can realize more functions. Reliable product, don&apos;t miss it! 【Two Modes Positioning】Achieving real time accurate location of kids by advanced GPS+LBS(Base Station) positioning, easily checking the position at anytime anywhere. 【Voice Conversation】Both watch and the mobile phone can send and check voice messages. 【2G Communication Mode】Insert 2G SIM card, you can talk to kids at anytime. 【Precise Positioning】You can check the watch&apos;s location in real time via the mobile phone APP map to know the position where the kids are. 【Electronic Fence】Settable activity range, it will alarm once the watch is outside of the range. 【Emergency Call】In case of emergency, children can long press SOS button, and the watch will auto dial the preset SOS number in turn until get connected. 【Camera Function】Built-in 300,000 pixels HD camera, and kids can capture wonderful moments anywhere and anytime. 【Forbidden in the Classroom】You can set the forbidden time while class time, so the watch features are not available when the children is in class time to ensure the normal order of the school. 【IP67 Waterproof】The watch supports IP67 waterproof function, which can better avoid damage from sweat, washing hand, water splashing, rain, and swimming. 【Other Functions】Remote Turn Off, Historical Route Tracking, Anti-lost, Low Power Alarm, Time Display, Alarm Clock, Incoming Phone Call Firewall, Pedometer Function, Make Friends Function, etc. 1. For better use, please read the user manual carefully. Please download the APP software according to the user manual and install the software on your phone. 2. The watch supports IP67 waterproof function, but please do not put it in hot water or warm shower, otherwise it may be damaged. 3. The product&apos;s color may exist slight difference due to photographic conditions such as lighting, thank you for your understanding.